Before I started this weekend endeavor, I had my doubts. I wondered if my enthusiasm would hold through the weekend. As much as I wanted to take the weekend and see three major-league ballgames in three different ballparks, there was a part of me on Friday that just wanted to go home and splay myself out on the couch to read some magazines or pop in a DVD. But as that 7 train pulled into the Willets Point stadium and I saw the high definition screen outside Shea Stadium announcing, MERENGUE NIGHT IS SOLD OUT, I got the feeling that this weekend would be nothing but fun; there would be no funk. As I crawled into bed at 2:30 a.m. after Matt and I had convened again with Brad to discuss the game over a few pints, I figured 9 a.m. would come too soon. Yet when the alarm went off and I pulled myself out of bed, there was no dragging of feet. Matt and I watched Lance Armstrong pull into Paris and then I tossed my bags into the car and returned to the interstate. Recent world events have prompted an increase in security, particularly in the various means of transportation, so as I pass through Maryland, Delaware, Pennsylvania and New Jersey, I am greeted with various variations of the same message flashing on the overhead LED displays: REPORT SUSPICIOUS ACTIVITY. In Delaware, they use the state’s postal abbreviation so that the sign read, DE TERRORIST TIP LINE, followed by the phone number. I keep my eyes peeled throughout the drive, but the only suspicious activity I may or may not have encountered was not worthy of a phone call: a car with New York plates going the speed limit, a BMW cruising along below 70 mph, an SUV with a “Save the Trees” bumper sticker, a New Jersey driver leaving appropriate distance between the car in front of it, a hybrid car with a George W. Bush decal. These things aren’t the usual activity from such drivers, but they don’t seem to be threats to national security. As I suspected, the drive takes two and a half hours, so I exit I-95 just after 1 p.m., find the parking lot that will give me easy access to New Jersey after the game, and buy my ticket with enough time to spare that I make it inside in time for the National Anthem, the first time in three days that I’ve not missed the first pitch because I’m still en route to the ballpark. I enter on the first-base side but must walk around to left field to get to my seat, so I turn right to walk down Ashburn Alley, the outfield plaza packed with concession stands, standing-room views and a Phillies timeline posted on the back of the brick batters eye in center field. Despite the recent comments by Peter Gammons and John Smoltz, just two of the esteemed baseball men who have come forward to pan the ballpark as a place to play, it remains a fabulous venue in which to watch a game. I ask for a seat in the shade, not wanting to commit to the sun on a hot day. For $22 I am placed in left field, in prime home run territory. As it turns out, I am just outside the edge of the overhang that would’ve provided the shade I asked for, but it didn’t matter. I spend about an inning and a half in my seat; the rest of the time, I wander the ballpark. It’s conducive to such perambulations. The wide, airy concourses might as well be enclosed and air conditioned, the difference between those areas and the open sunshine were so great. 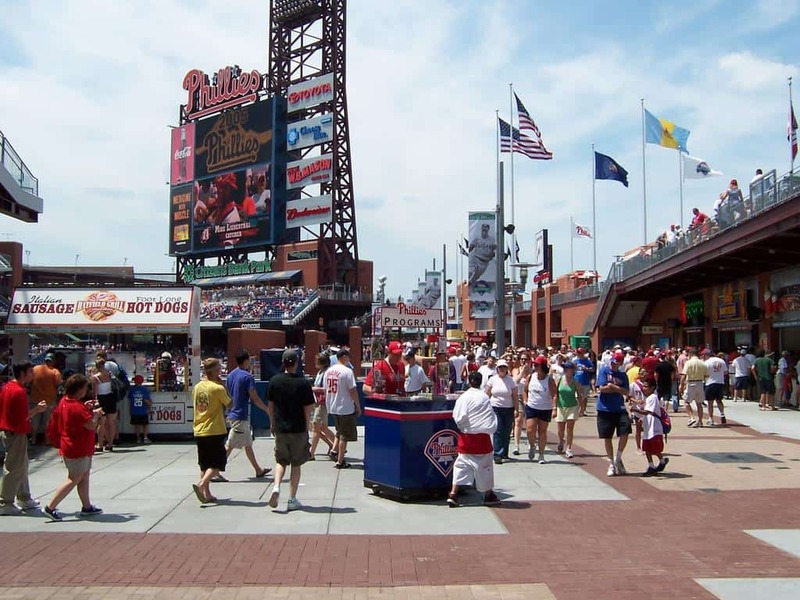 I’d also guess that 90 percent of the space around the park includes chest-high shelves on which fans can place their just-bought cheesesteaks and watch and eat while they stand and watch the game. 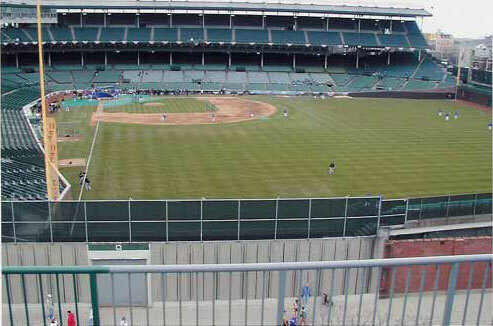 If you wanted to get exercise at the ballpark, you could buy the cheapest ticket available and spend the entire game walking laps around the park without ever losing view of the field except for the brief half-minute it would take you to walk behind the scoreboard and Harry K’s restaurant in left-center. The gripe Gammons, Smoltz, et. al. have, though, is somewhat legitimate. Pop flies can end up eight rows deep in the outfield. Power alleys are chip shots. Tomas Perez, playing shortstop, goes back on a pop up — as any shortstop would in this case — but because left field is so small, Pat Burrell is playing so shallow that he calls Perez off. When Perez circles around to return to the infield, he’s closer to the warning track than he is to the infield dirt. They’re clever there in Philly. As the public address announcer finishes off the day’s lineups with the umpires, the theme from Law & Order serves as background music. When San Diego’s pitching coach walks out to the mound with catcher Ramon Hernandez for a conference with starter Brian Lawrence, the choice is the theme from Three’s Company. Sometimes it’s lonely going to ballgames alone. If you go to see a specific player — say on a night Pedro Martinez is pitching, or in the minors, to catch a top prospect — then you have a purpose. You can keep score and then pay particular attention to Pedro’s innings on the mound or the prospect’s at bats; use the other innings for trips to the beer cart or the bathroom. 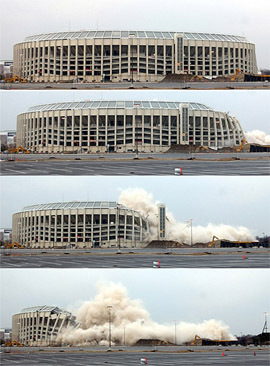 This is why I felt the need to view Shea Stadium in a different way on my Friday night trip. I was there just to kick off the three parks in three days weekend, not for any other reason. But as a Mets fan, it was easy to cheer and high-five the strangers around me on big plays like Carlos Beltran’s three-run home run. In Washington, I sat with a friend and conversed with his fellow season-ticket holders around us. But the energy of the crowd inspired me to stand and cheer when a Nationals pitcher got two strikes on a Houston hitter, even though a Washington loss would be better for the Mets’ position in the standings. For one night, I allowed myself to enjoy the atmosphere of a division rival. It made the ballgame more enjoyable. The night before going to Philadelphia, I wondered how the fans would be. 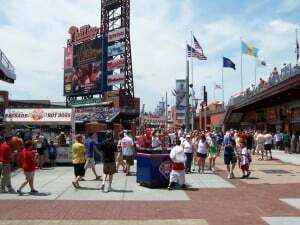 Going in, I expected Citizens Bank Park to rank third in enthusiasm behind Shea and RFK. The city is known to be passionate about its professional teams … mostly when they’re winning. These days, it’s an Eagles town first and foremost. Until the lockout, the Flyers were probably No. 2 among the four teams. The 76ers may have fallen to last now that they’re a few years removed from Larry Brown and the finals appearance against L.A. 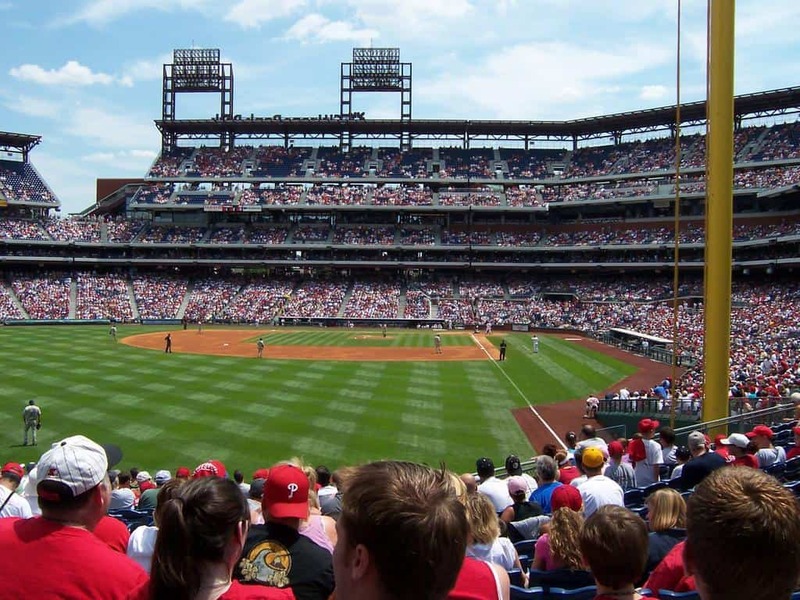 The Phillies fluctuate throughout the season. They’re higher on the list in April, when they’re in contention; if they fall eight or 10 games back by the time Eagles camp opens, they also tend to become the city’s second sports interest. Among 35,322 fans on an 83-degree sunny Sunday (the smallest crowd of the weekend by 7,000, but bringing the total crowds of which I’ve been a part to 128,275), I do experience moments of Phanaticism. It doesn’t reach the levels I felt in New York or Washington, but when Ryan Howard launches a double (mere feet from a home run, from what I can see) to left-center in his first at bat, then doubles into the right-field corner to deliver a run his second time up, I stand and cheer. Sure, it’s probably more for his days as a BlueClaw, but I still find myself involved in the game. As I said, I don’t sit long in my left-field seats. The breeze is nice but I still feel like I’m baking in the sun — and getting an uneven tan with the sun directly to my right. I get up to walk along the third-base concourse, stopping into the team store before catching another half-inning standing at the back of the seats, in the shade, on the walkway. Again it becomes clear that when this stadium was designed, the fans were the first thought; the pitchers, clearly, last. I continue out towards center field and Ashburn Alley again, passing the left-field gate and looking out on the sea of cars, the parking lot where Veterans Stadium once loomed. It’s the first time I’ve been to this south Philadelphia sporting complex since a January night to watch Notre Dame play Villanova in basketball at the Wachovia Center. 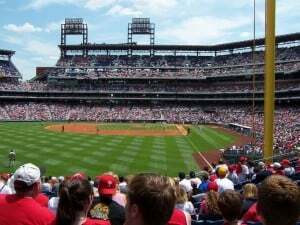 Now all that surrounds the four arenas — Citizens Bank Park, Lincoln Financial Field, Wachovia Center and the small Spectrum — are parking lots and warehouses. If it weren’t for the new stadia and their restaurants, there wouldn’t even be a place to eat. The biggest drawback to this beautiful ballpark is that it’s in the middle of nowhere and can never rank with PNC Park in Pittsburgh or Camden Yards in Baltimore among the best places to spend a day and catch a game. 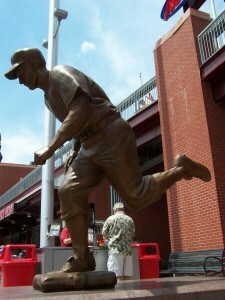 I pass again by the statue of Richie Asburn beating a throw to the bag, I suppose. 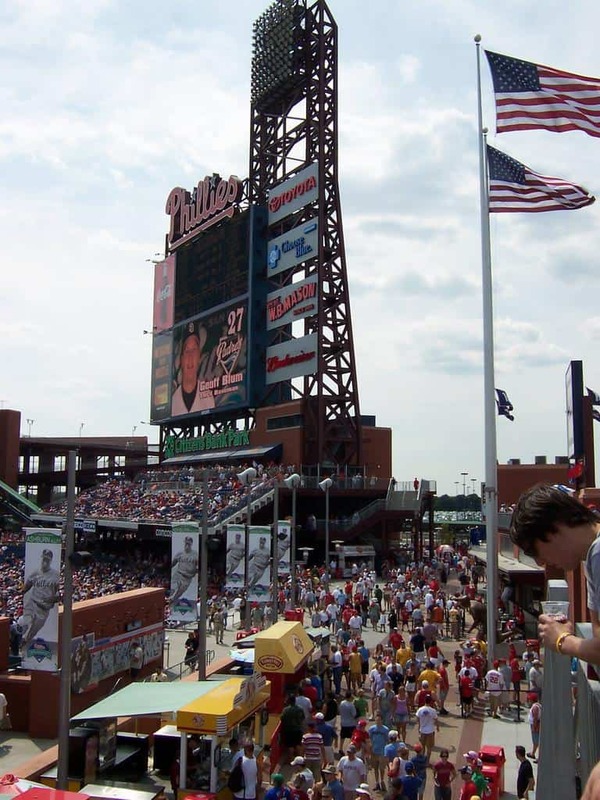 I climb some stairs to the bleacher section perched atop the concession stands beneath the big Liberty Bell scaffold that lights up and sways whenever a Phillie goes yard. Here I can look down upon Ashburn Alley while getting a far-away view of the field, perhaps somewhat like the vantage point those rooftop fans around Wrigley Field see. When a spot along the railing below, the one overlooking the visitors’ bullpen, opens up, I slid in, resting on the shelf beside a kid chowing down on a carton of seasoned fries from one of the counters behind me. I watch Clay Hensley warm up before he pitches the final two innings of this 5-1 Padres loss. The beauty of this spot is the closeness to the game. I can discern the stitching on Hensley’s jersey, I can hear the zip of the ball as he brings his arm around and releases the orb at 80 mph to the catcher 60 feet to my — to our — left. Perhaps best of all, I can hear what Hensley hears, that being the taunts and jeers of the famously harsh Philly fans. Just as Hensley gets up to loosen up, Scott Linebrink also emerges from the bench beneath our feet. He stretches his legs, then uses the elastic band strapped to the railing to loosen up his arms and shoulders. “That’s right, Linebrink, warm up!” shouts one fan perched behind me up near the bleachers. “Make sure you get that goatee nice and loose!” The comment makes no sense, but therein lies its hilarity. I study Linebrink’s face for any sign of acknowledgement, finding none. But I like to think he heard it and was amused by it too. As I spend the day exploring the ballpark more than sitting still to take in the game, I feel as if I am in a familiar place. I glance at faces looking for signs of recognition; I have this feeling that somewhere in this crowd is someone I know. This sensation, I later decide, stems from two things. The first is the ballpark’s proximity to New Jersey — just over the Walt Whitman Bridge. No doubt there are a lot of Garden State Phillies fans here. 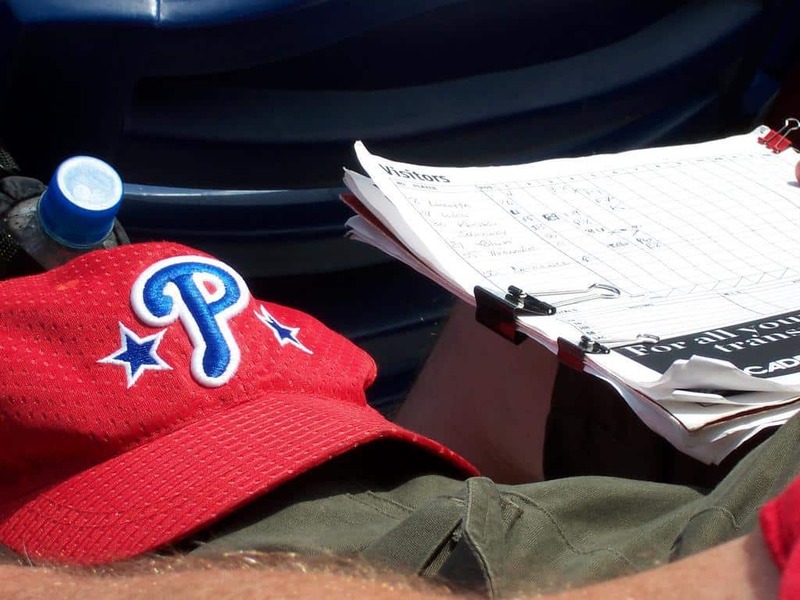 The other is derived from the familiar t-shirts and hats, either from a Jersey Shore vacation/recreation town or the Lakewood affiliate of the Phillies. I’m wearing a red BlueClaws hat myself to go along with my Gavin Floyd Phillies t-shirt. 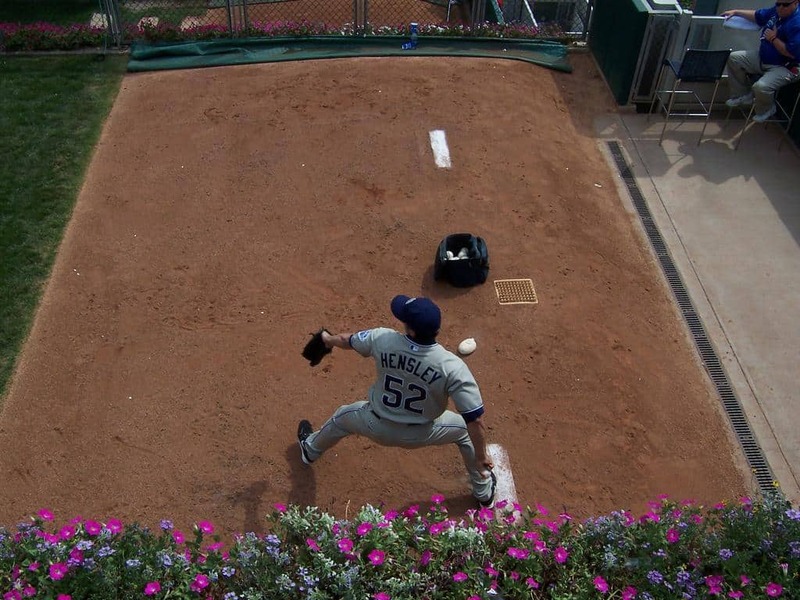 So as I stand along the bullpen, watching both the game and Hensley’s warm-up routine, I’m not startled — perhaps I’m even expecting it — when a hand rests on my right shoulder. I turn around to see Hal, a BlueClaws employee I know from my days covering the team. In that moment I’m amazed more at my expectation of running into someone I know than I am at actually seeing such a person. We spend an inning or so chatting about the game, the ballpark, the BlueClaws before we split up for separate sustinence; now that the line has virtually disappeared at the Italian ice stand, I make my first in-park purchase of the entire weekend and get perhaps the best bargain at any of the three venues when a decent-sized cup of cherry ice is just $3.75. Even my small (or “like it”) sized cup of Cold Stone ice cream cost more than $4. I take the ice up to the bleacher perch again to enjoy both the coolness inside my body and the complimentary breeze outside. By the time I’m finished, my tongue has taken on the same shade as the hat and shirt I’m wearing, that of Philly and BlueClaw red. It’s not long before Billy Wagner comes in and shuts down San Diego with perfect ninth inning and I’m scattering with the fans out to the surrounding parking lots. I’m quick to the car despite emerging from a gate behind right field rather than along the first base/right field line and losing my bearings. I walk left up the road at first before realizing that this doesn’t feel right though there is some familiarity because I’m heading to the lot where I parked for a game last September (and I had been hoping to find again on my way in today). I turn the other way and head toward an intersection that I soon see is Pattison Ave., where I did indeed park in a moderate sized lot that does not have a bottleneck at the exit. I am out of there before I get to find out whether one forms or not. Thankful for the small but discernable signs pointing to I-76, I’m back in New Jersey in no time, cruising up 295 and then 130 to avoid the Turnpike traffic. When I do join the toll road at exit 8A, I’m north of the congestion and find myself coming through the door to the apartment a mere two hours after the game ended. Exhausted, I make dinner and watch TV and manage to pound out the account of Saturday’s visit to D.C., unsure exactly of how I am able to stay away until midnight. But it was worth it to relive the day before and record an account of this wonderful weekend while the images and sensations are still clear in my mind. My doubts about my stamina, my endurance for a three-park road trip in three days did not surface after Friday’s initial questions on the way to Queens. The proximity of the three cities to one another and the comfort of a bed in Matt’s house rather than a lifeless hotel room certainly made the trip more bearable, not to mention the camaraderie the three of us shared over burgers and beer and more beer. I’m happy, too, that I stuck to my budget and limited my expenditures to tickets and higher-quality meals and drinks outside of the ballpark concessions. Before embarking on the trip, I told Casey that, other than the games for which I already have tickets, I think it’s just minor-league ballparks for the rest of the summer. 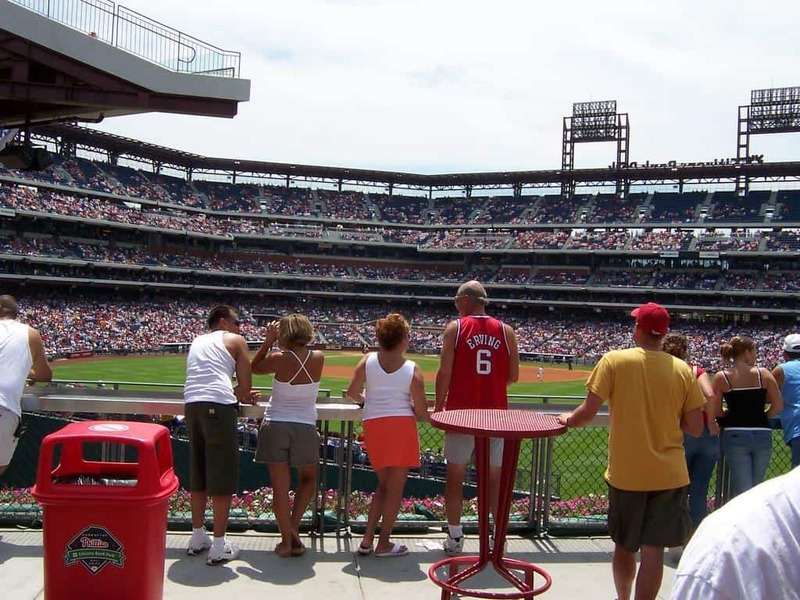 These major-league prices can take a toll on your wallet. My passion for the game is as strong as ever, so I suppose it’s no surprise to me that I’ve already looked at which teams are at home this Saturday, when Casey’s away again. I’m happy to get in as many games as I can now, because once December rolls around, when we’re two months removed from the World Series, in the dead period between the end of the college football season and awaiting the bowl games, I’ll be itching for springtime and the start of another baseball season.